GE Fanuc Intelligent Platforms , a unit of GE Enterprise Solutions, have introduced StationPortal, a breakthrough solution for discrete assembly support tasks. StationPortal provides a new architecture for assembly support systems, increasing the speed of deployment and optimisation, while providing a lower total cost of ownership. The StationPortal is a great fit for tasks such as error proofing, line balancing, material call, and other production support tasks. 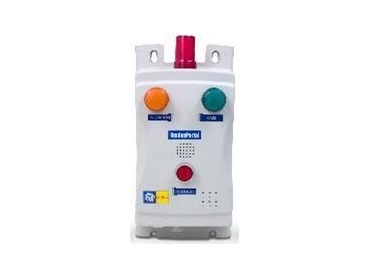 StationPortal provides a common Ethernet interface for typically disparate I/O such as pushbuttons, bar-code scanners, LEDs and torque guns. These inputs, and importantly their information, tie directly into GE Fanuc’s new Proficy HMI/SCADA -CIMPLICITY 8.0 software package for discrete manufacturing, which comes with a 100–tag data historian. This architecture provides the power and flexibility of a central, server-based configuration. StationPortal’s installation requires standard wall power and an Ethernet connection only. StationPortal is an alternative way of setting up the factory floor, because it gets rid of the traditional reliance on more expensive and complex, PLC-based assembly support systems. By using a central, server-based configuration over Ethernet, manufacturers can eliminate PLCs and flatten the architecture for production support tasks. This simpler architecture gives the user flexibility and reduces the time required for activities such as line balancing and system modifications. Each StationPortal unit has 3 discrete inputs, 3 discrete outputs, 3 coloured lamps, 1 pushbutton, 1 horn and 1 serial port. Each of these data points is mapped directly into CIMPLICITY.